They all complained about their significant others. Many of their issues were minor; they were small annoyances that had built up over time. Some of them were frustrations that indicated greater underlying problems in the relationship. I could see surprise and denial in his eyes. He believed me, but also believed that that wasn’t going to work for him. Sadly, this is the attitude so many people have. They refuse to talk to their partners about their relationship problems and instead share their frustrations with friends and family. I’m here to tell you that venting to other people about your partner is NOT a healthy practice. It’s inconsiderate, destructive, and only showcases your insecurity within the relationship. You want to please your partner. Even though you have disagreements or they do something that annoys you, you don’t think it’s a big enough deal to tell them. As long as you just let them be, they’ll be happy. In turn, you occasionally complain about these quirks to other people to get them off your chest. You want to avoid conflict. Maybe you’ve tried addressing some issues and it ended in a heated debate. Nothing came from it. So you feel it’s best to just avoid that and deal with those problems by talking through them with other people. You just need to blow off steam. I understand — sometimes you’ve had a bad day, your partner gets on your nerves, and you just need to get your feelings off of your chest. A few minutes talking to some buddies makes you feel all better. You think it gives you something to talk about and bond over. When you’re making new friends, complaining together can be an easily shared avenue for discussion. With old friends, it’s so common for everyone to catch up and then dish the dirt on their romantic lives. It makes you feel connected, supported, and like people get you. 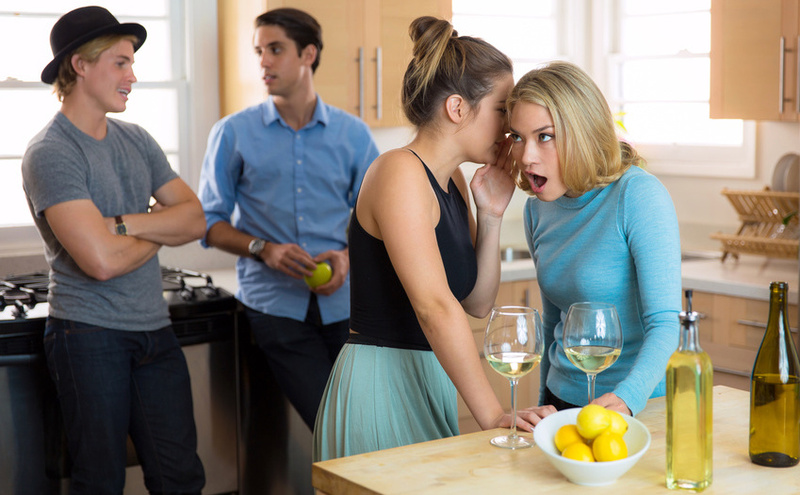 These all seem like real reasons to gossip, right? Sure, they may make you feel better for a little while. You complain to try and deal with your relationship. You feel relieved and ignore your qualms with your partner…for a while. But you haven’t actually worked together to address and fix those issues. So those problems, big and small, linger. They gnaw at you. They test your patience. They eventually boil up until they’re all you can think about. You start to feel hurt because your partner isn’t changing their behaviors. You get frustrated because your needs aren’t being met. You start to assume malintent based on their actions. You think…maybe they don’t care enough to change. Maybe they’re not as compatible with you as you thought. Maybe they’re doing it to secretly piss you off. So now you’ve gotten yourself all worked up with anger and blame, when you haven’t even given them a chance to know the truth about how you feel. You’re telling yourself stories about their motives and resenting them for it when it could just be ignorance. Sometimes this escalates to massive fights where you unfairly attack your partner for everything you’ve been holding in. This can be devastating to the other person when they realize you’ve been secretly upset with them and can even lead to the unnecessary end of a relationship. But the resentment doesn’t stop there. When you’re bad mouthing your partner to friends who care about you, they only get one side of the story. They see all the faults in your partner and get mad at them along with you. They speculate about your partner’s intentions and make up stories that only add to your frustration. It’s not fair to depict your partner so negatively to people who may know you both for a long time. You’re not giving them a chance to defend themselves. And your loving friends will give you advice based on their jaded perspective. They’ll jump to terrible conclusions and often tell you to make rash decisions. How do you think that will turn out? Really consider what you’re venting about before you have all your family and friends thinking, “You deserve better than that man/woman!” for the rest of your life. Worst of all — what happens when word gets back to your partner that you’ve been talking bad about them behind their back? The people you tell will slip up or gossip. Or they’ll try to fix things on your behalf. They may even try to have a “talk” with your partner or treat them differently. There’s nothing more heartbreaking than knowing someone they love thinks so low of them. That you’ve been putting on an act this whole time. That you’ve been lying to them. How do you expect your partner to trust you again? You’ve betrayed them and they’re forever embarrassed because of everyone you’ve told. If you really care about someone, evaluate what this gossip is worth to you. Because with one wrong move, you may just lose that special someone over something stupid. So if you shouldn’t complain about relationship problems to your friends or family, who should you talk to? You have to become a better communicator with them. And they have to do the same for you. Mutual respect is the ONLY long-term solution. You need to work through things and grow together to sustain a healthy relationship. That means having uncomfortable moments where you’re vulnerable with each other. Learning to address hot-button issues without breaking into arguments. Trying to not attack the other person when your ego is bruised. Dropping your pride when it means resolving a problem. That means speaking up early on when you notice something that bothers you. Not letting stuff build up. Setting healthy boundaries and expectations. Seeing things from the other person’s viewpoint. Finding compromise. Reading great books like Crucial Conversations on dealing with tough talks for the betterment of your connection. That could mean finding someone you BOTH agree to talk to, if necessary. That could be a counselor or a friend acting as a third-party mediator. But that’s still a supplement to you working on your communication together. No one is saying this is easy or an overnight change. In fact, maintaining that respect challenges your security, forces you to be more open-minded, and can be emotionally draining. It may be the hardest thing in a relationship to follow through on. But it’s also the most important. I don’t care if you’re worried they’ll get sad or defensive. I don’t care if it’s really scary and challenges your ego. I don’t care if you have to endure tough conversations. You need to fight for healthy communication from both sides. There’s no excuse to handle your relationship any other way. Because people who care for each other, want the best for each other. And if you’re with someone who won’t ever strive for what’s right, then maybe you’re with the wrong person. So if you care about your loved one, please talk to them instead. What about telling your friends stuff you’re doing together or that has been challenging for you as a couple? We recently bought a house and ran into issues with the lender. It stressed me out and I wanted to discuss it with a friend who had been through the same thing. Do you think that’s okay? Sharing adventures and struggles you and your partner are dealing with together can be absolutely fine. It’s fine to share positive experiences and stories of growth, too. What’s not healthy is complaining or revealing something intimate about them without their consent. I dated a girl from my social circle once. I found out she was complaining to a mutual friend and he was comforting her by telling her she deserved better. He definitely had a crush on her himself. I tried talking through it with her but in the end she had said too many bad things about me. I couldn’t look at her the same so I broke it off. I also ended that friendship. Not only because of that situation but similar shady things he had done in the past. It sucked but because I know how it feels I would never do that to someone else now. Sorry you had to go through that. It’s tough to find out one close person has been betraying your trust, let alone two. But it seems like you grew from that experience and will use those lessons for a better relationship in the future. Congrats on taking something healthy away from instead of assuming the worst in the future. You make some very valid points, agree fully with them. Problems should be solved with partners, not ranted about with friends. But what I also sometimes do, is discuss things with my partner. AND with some good friends. See their perspective as well. I make sure they are good enough friends, they will point out my flaws as well in the situation. But sometimes getting this outside perspective on the situation helps. No substitute for constructive relationship debates though :P.
Glad to hear you raising this Nick. I have had terrible problems with my husband doing this to me. He has his whole family hating me because of his lies and such disrespectful negative comments. We had rows and would ask him to leave when they got really bad and he would go to his mother’s and twist everything. He even dated other women all the while telling me he loved me and wanted to work things out. I believed him and trusted him. Worse still after I heard everything back I forgave him and tried to make things work especially for our son. Now I have heard he bad mouths me to work colleagues that he barely knows and it hurts so much. The trust is already so damaged this just pushes me over the edge.